No need to look any further. The Hooters Casino Hotel offers outstanding service for your meeting, special event or banquet. Our experienced staff will ensure your entire event is a success. We will facilitate all your needs for groups ranging from 10 to 200. Imagine hosting your corporate party, sports team or bachelor party at the most fun place in Las Vegas. Yes, we do serious, too. We can host your small board meeting to a large general session. We will work with you every step of the way to ensure a successful and unique experience with great service. Clearwater Room – Conveniently located on the 2nd Floor, just off the casino, the Clearwater Room is the perfect location to host your private meeting or event. The 4,500 square foot meeting room has a small foyer for registration with private bathrooms and its own elevator leading up to the space. A variety of setups and configurations are available and our catering staff is ready to take care of all your needs. Presidential Suite – The 1,600 square foot Presidential Suite offers a large great room with a wet bar, two half baths, a pool table and plenty of space to entertain. There is a separate bedroom with one king bed, Jacuzzi tub and a full bath with a stand-up shower. The suite works perfectly for entertaining, a hospitality suite or for VIP guests that are looking to have some extra space. Conference Suite – The 750 square foot Conference Suite has a pre-set conference table that comfortably seats 10-12. The suite offers a half bath, sectional sofa, wall mounted flat screen TV, wet bar with a pantry and full-size refrigerator. It is perfect for board meetings or as a hospitality suite. There is an adjoining standard guest room with one king bed that can be made available upon request. 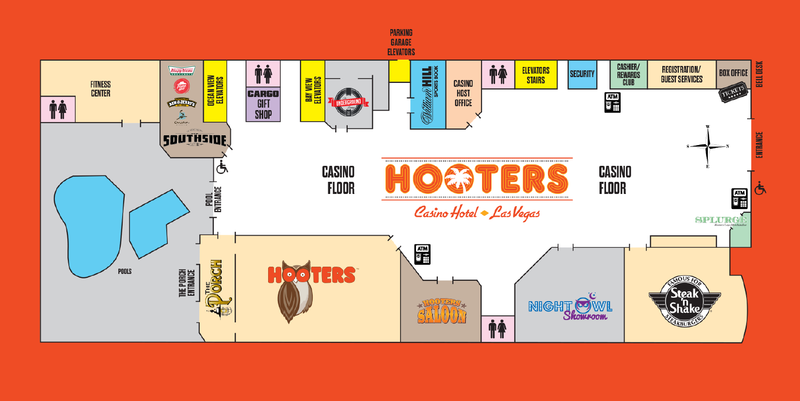 Make your visit to Hooters Casino Hotel more special with dining and gaming credits and free parking. Hooters Casino Hotel shows our appreciation with 15% off and 2 welcome beverages! Are you an AAA member? Your discounts are waiting and, as always, enjoy FREE PARKING at Hooters Casino Hotel. Are You A Government Official? Get 15% discount off your stay. The Hoo Ya One pass provides free show tickets, a nightly happy hour, drink coupons, food vouchers and more – a $250 value for only $49. Receive two breakfasts, per day, from Steak 'n Shake when you book this package! Let’s get this party started EARLY! Exclusive offer for California Residents including early check in and free drinks.